The above is a screenshot of the aggregated coverage over an approximate 120 hour period from last Saturday to now. The rings are spaced 50 km apart. As you can see, there are even a few a/c locations over 400 km away, which is incredible given that the house is in a bowl surrounded by hills or mountains in nearly all directions. For that one particular coverage radial SE into Sonora, that happens to be a very narrow clear shot (not including trees) from the house toward the horizon. Initially, my setup included a simple discone antenna already sitting up on the roof, but in a day I had built the “QST Special” ADS-B antenna and my number of location messages went up from about 35k per day to over 130k per day. After a few days of that, I raised the QST antenna by 4′ to get it above the parapet wall that surrounds the roof and the number of position reports went up by about 10-15% to about 150k. Next, I found in the garage a cheap (cheap being $5) cable satellite preamp and put that in line with the antenna. The position reports skyrocketed from about 150k to well over 200k per day. In fact, yesterday’s summary shows 240k+ position reports, and about 300 per second at peak times of the day. Here’s a chart which shows the changes in performance as a function of time and setup. As can be seen, the performance continues to improve as the setup is further tweaked. Today (30 Jan) looks to be a bad day for reception. It has been raining lightly (about 0.03″/hr) since before midnight. I expect that at the current rate the station will receive only about 160k position reports today, which will be about 2/3 of yesterday’s performance. My assumption right now is that the connected rain drops on the antenna radome are causing significant loss of signal at the antenna radome (the ABS pipe it’s covered with). It’s also possible that the added attenuation of the signals as they travel through the rain clouds and falling rain is a factor. Not sure which is more significant. At 1090 MHz, light rain shouldn’t be a really significant issue, but perhaps the PiAware software decoder is running right on the edge of performance so even a dB or so of added loss could have an impact. While the rain is great, I look forward to a few weeks of dry skies so that I can get a solid number on the performance as a function of day of week. Enough about non-wireless stuff for the time being. Today, after a few weeks of inaction, I set up my Raspberry Pi B+, the FlightAware PiAware ADS-B code image, and deployed my first ADS-B receive site! It was easier than cake. It was stupid simple. In fact, the most challenging thing was discovering I didn’t have a microSD card and so I had to drive over to Fry’s and grab one. What’s ADS-B? Why, it’s “Automatic Dependent Surveillance – Broadcast”. 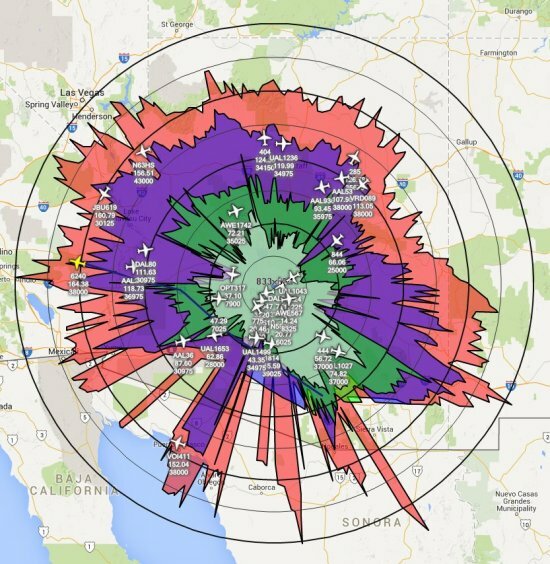 many (and more every month) aircraft, private and commercial, have GPS and a 1080 MHz transmitter on board to send a position message every second. For air traffic controllers, this means much improved position/speed/heading/altitude resolution. For the rest of us, it’s like having our own window at the air traffic control center and watching blips on the radar moving at 400 – 500 mph. More soon as I get things going. After a number of days of clouds and rain here, I walked out of the grocery store and was impressed to see two bright planets low in the western sky. One was obviously Venus, the other was a little orangey and initially I thought it might be Mars. However, a quick check on the Internet shows it to be Mercury! Both planets stand out beautifully in the twilight sky, and with Mercury preceding its brighter sibling toward the western horizon. I pointed the N7UVCAM2 Roving Reporter toward the pair, and captured a few images. I will post them here as soon as I figure out what’s going on with WordPress. What Good Is a Wireless IP Camera? I recently installed a new weather station here at the homestead. With a weather station, it’s always nice to be able to have a picture of the sky to see what the sky looks like, to augment and bring to life the sparse yet functional gauges and dials. The world of digital image capturing devices is a miasma of terminology, mis-terminology, ignorance and sometimes (at least so it seems) a bit of disingenousity. Go to eBay, type in “IP network camera outdoor”, and there’s at least a zillion, give or take, cameras available from no end of sources, mostly in Asia. Not being really up on the latest and greatest for IP network cameras, all I really knew going in was what I wanted. The camera needed to be 1) able to withstand living outdoors, in the direct sun and rain; 2) at least 1080p vertical resolution; 3) as sensitive as practical, so I could see an image at night, and hopefully see a few stars; 4) cheap (hard to define); 5) have an included webserver so that with a browser it’d be possible to see the image, and be able to ftp an image on a scheduled (not event) basis to the WUnderground site where my Personal Weather Station data is displayed; and 6) straightforward to configure and tweak. I know, it’s a lot to ask, especially with 4). One thing that is missing in the above list, and some might wonder why, is the choice of wired vs wireless for the connectivity. After all, it’s the “WirelessJon” website! For this particular installation, it really wasn’t much of a decision to make. A camera takes a significant amount of power to operate (several watts at least). A wireless camera takes at least as much power to operate as an equivalent wired camera. Since a wireless camera would need a source of power, likely the house mains, a cable would still have to be run to supply the power to the camera. If I’m going to the trouble to run wire, I might as well kill two birds with one stone and use that wire to supply connectivity as well. Also, my desired camera might be streaming video on occasion, and that could end up being a significant load on my home wireless network. Finally, ensuring that the wireless coverage from the inside of the house would be good enough for robust connectivity to gadgets on the roof would mean that there’d be a constant unknown as to whether or not a problem in viewing the camera’s image was caused by RF propagation or by some hardware issue. So, like I said, the decision to go wired was pretty straightforward. I have another reason which made it simpler to go this way, which I’ll discuss in a future post on rooftop routers. As can be imagined, many of the requirements listed above are mutually incompatible. And by “cheap”, I was aiming for somethiing under $100 delivered. Nonetheless, I started my search through Google and eBay as well, working to figure out some of the more esoteric terms (RTSP, DNC, AE, etc.) and attempting to validate things like FTP server and web browser functionality and configurability. A simple thing that I wanted was a scheduled capture on a regular, timed basis – something that doesn’t seem to be offered in most cameras listed on eBay – most offered appear to target the surveillance video market, and the cameras trigger video based upon events like movement in the field of view, or whatever. There were some challenges to figure out what many of the cameras actually did. Another minor tricky thing was camera sensitivity to light; remember in my wish list I wanted a camera that could even see stars (not just the Sun). I’ve always had in my mind something that I call the PoleCam, which is a camera trained at the north celestial pole and capable of watching the current pole star, Polaris, in its daily orbit around the north pole, Yep, it’s true, Polaris isn’t really at the celestial pole. It’s close (about 3/4 of a degree away, close enough for government work), but it’s not stationary. The ideal camera would allow me to see the movement of Polaris as well. But, I digress: the main purpose of this camera is weather observation. Cameras come with two different types of image sensor, CCD or CMOS, and a variety of lenses with different angular fields of view (FOV). Some cameras have varifocal lenses, where the “zoom” factor of the image can be changed to accommodate. For me, CCD is the only way to go for improving low-light sensitivity; compare a CCD imager with its equivalent CMOS imager and you’re sure to find that the CCD imager provides a higher quality image with better low-light performance. As far as lenses, it seemed that there were generally 4 mm, 8, mm and 12 mm used on the cameras for sale. Since I’d never bought one of these cameras before, I didn’t know how difficult it’d be to change the lens, so I decided to go with an 8 mm lens which should have about a 40 degree horizontal FOV. A tricky thing I discovered (I know, I was born yesterday) was that some of the eBay ads had confusing, conflicting, or flat incorrect information about the product offered. Doing searches which included “CCD” didn’t always return only cameras with CCD imagers – in fact, some sites would use the term “CCD” in several places when selling a CMOS camera. Also, attempting to figure out if a camera had a webserver built-in, and whether that webserver could respond successfully to queries that came in on Chrome, or Firefox, or whatever, not just IE, is quite challenging. Suffice to say, I did find a camera which appeared, at least in theory, to meet many (but not all) of my desirements. The camera I discovered appeared to have the following features: 1) outdoor operation, with an included sunshade; 2) 1920 x 1080 resolution; 3) CCD imager for good low-light sensitivity (hard to tell until it’s in your hands, though); 4) $70 delivered; and 5) built-in webserver, FTP server, etc. The things it didn’t appear to have included: 1) power over Ethernet (PoE), so I’d have to do that externally; 2) no idea of what the software was or how to configure the camera for my desired operating method; no idea if the camera was any good at all given the low price, and many other unknowns which wouldn’t be answered until I had one in my hands. So, I placed the order on eBay and awaited delivery of my amazing new $70 super webcam. More soon on what I found out when I opened the box! Welcome back to the WirelessJon blog – I’d taken a long respite from blogging, but it’s time to dive back in. Six weeks ago I decided that it was high time that the WirelessJon household had a professional-grade weather station. I’d been toying with $90 LaCrosse Technology all-in-one wx stations from Costco for many years, and each year or two or three I’d have to replace the hardware because something had stopped working. As well, the LaCrosse stuff didn’t have a nice way to fire the data to WeatherUnderground (or any other online service), so I had to run WUHU on a PC that was also running the LaCrosse Heavy Weather software. It was a kludge at best! One of my long-time friends and fellow ham Dave KD7DR is a local expert on weather stations. He’s been using both Peet Bros. and Davis Instruments stations for a long time now. He suggested to me that the Davis had better hardware quality – he uses a wired Davis Vantage Pro2 atop Pinal Mountain, an ~8,000′ peak about 60 miles east of Phoenix, and it’s survived well over the years. I also had some personal experience with a Peet, as I’d installed one at a 5,000′ site above the Tehachapi Loop in southern California back in 2008, and except for losing the anemometer cups to a heavy ice storm, it’s been a pretty solid unit as well. After some discussion and consideration, I chose the Davis Vantage Pro2 as the baseline. The next decision was whether it would be the wired or wireless version. The external sensor location is on the roof of the house, and I already had a 2″ cable conduit running out to the general location. However, that conduit is stuffed with other cables, including RF coaxial cable, and I didn’t know whether I wanted to pull yet another cable through the already-tight conduit and didn’t know how the slight leakage from the RF coaxial cables might impact the weather sensor readings. Time for more investigation. I went through the Davis literature and discovered that they’d had the foresight to put “low-pass” filtering on the sensor lines, so what coupling there might be should be alleviated by the filtering. As well, my RF coaxial cable is either LMR400 or LMR240, double-shielded, very low leakage, and none of my transmitters are more than about 50 watts, so it’s likely that the amount of power deposited onto the wx sensor cable leads would be pretty low. It would also be common mode, so that might help reduce any concerns as well. The last factor for wireless was the choice of RF frequency that the Davis unit uses. It employs some sort of proprietary frequency-hopping transmitter in the license-exempt 902-928 MHz band. Given that I’m a ham and may want to operate in that band (actually, I do have some equipment but it’s currently receive-only in the house), I decided that I didn’t want to pollute that band any more than it was already. Importantly, I had to look at the type of cable that connects the Davis weather sensors to the console and what connectors are used. Again, a few checks using Google and I found that the cable supplied by Davis is just 4-wire “phone” cable, much like the old silver-colored soft, flexible wire which connected old-time wired POTS phones to the wall outlet. Except that the Davis wire had a UV-resistant jacket. Kind of necessary for an outdoor install, especially here in Arizona. The connectors were the clear plastic 6P4C “RJ15” type, readily available in my garage, as was the crimp tool. Finally, the way the cable was constructed was straight-through, so there was no need to worry about some custom wiring configuration. The next consideration was how much weather did I want to sense? Since I tinker with solar power a bit, both on the house and on the truck, I’ve always wanted to know the total solar insolation at the house, and ultimately be able to calculate the peak, average and cumulative power/energy delivered to the ground. And while I was spending all this money, I decided to get the UV sensor as well. Never know. I chose not to get the active aspirated temperature sensor, but I believe I could add that on later if I choose. One final consideration in the wired vs wireless debate is how to get power to the sensors. Weather sensors are just like any other device – they need some juice to allow them to make measurements and report back the information. The wireless Davis unit employs an add-on small solar panel and built-in battery to collect and store electrical power to run the sensors and the wireless transmitter. According to everything I’d read, it works well and the batteries have a good lifetime. But, here in Phoenix, things exposed to the sun get very warm, and batteries up on the roof are going to be in a fairly harsh summer environment. Also, the failure of the most recent LaCrosse unit appeared to be a failure of the built-in solar cell to charge the little NiMH batteries in the anemometer. Using a cable would allow me to avoid completely any concern over having to change batteries in the future. Now that the wired vs wireless decision was made, it was time to look at the ability for the Davis to push data to the internet. They have a number of interface dongles which plug into the display unit. One is a serial port connection, which requires a PC to run software to manipulate and push the data to the web, and the other was a thing called the WeatherLink IP, a slightly different dongle which plugged into the same socket on the Davis display head but instead of serial had a nifty RJ45 socket and talked IP. It seemed that this allowed me to divorce the entire process from a PC. The one primary drawback was that the literature indicated that the weather data could only be pushed once every 15 minutes. At this point, that seemed ok (i’d come to be unhappy with this later). That was that. I called up Andrew Revering at Convective Development and placed the order for the Davis Vantage Pro 2 Plus wired station and the WeatherLink IP dongle. Less than a week later a big box showed up on the doorstep, and the day after Thanksgiving I installed the entire thing. Later on I’ll talk about some of the good, could-be-improved, and mediocre things I’ve found with the Davis, both mechanically and operationally.